As soon as I started playing it one thing was very clear, this could very well be a companion piece to SPAMALOT. I believe the action takes place in the same time frame; besides that, the music also reminded me of the Monty Python’s musical. Although he wrote one of my all time favorite songs (“Human Again” from BEAUTY AND THE BEAST”), I’m not a huge fan of Alan Menken, but he surely knows how to write good songs. He has a special touch for beautiful emotional pop ballads, but he also manages to give us strong conventional musical songs. The first song I heard was “A Day in Richard’s Life”, which with its pop-rock rhythm scared me a bit, but “Comedy Gold” followed it and I relaxed. This is not Menken’s best score, but it has more than a couple of good songs. Among them, my favorite is the very Broadwayish “No One But You”, sung by the ladies leaded by Mallory Jansen. The title song is pure Menken and so is the romantic duet “Love is Strange” and the romantic quartet “Maybe You’re Not the Worst Thing Ever”. The lyrics by Glenn Slater don’t seem to take anything seriously and easily put a smile on our face. Joshua Sasse and Timothy Omundson, as Galavant and King Richard, seem to have fun and so does the rest of the cast, specially Ben Presley. I just wish they gave Faith Prince a little bit more to sing. But this is an amusing score and some of the tunes are quiet hummable. There is no character called "King Arthur" in GALAVANT. Also, the BEAUTY AND THE BEAST song is titled "Human Again" not "Be Human Again." Thank you, I've just edited my review. 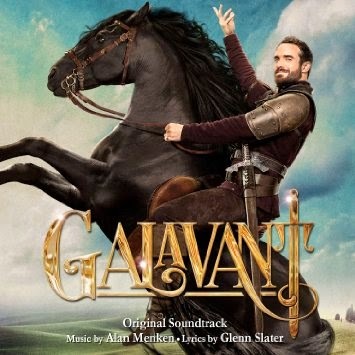 I haven't seen the GALAVANT television series and I was convinced that King Arthur was one of the characters. As for "Human Again", I don't know where I had my head. Once again thanks for your remarks.